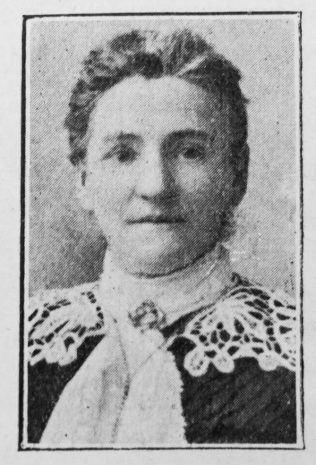 Lydia Haigh was born at Scholes June 13th, 1853, and died suddenly at Rothesay Sep. 13th, 1906. After an enjoyable holiday she and her husband were about to return home when she was called hence. Brought up in an atmosphere of religious reverence she had from early years some experience of the things of God. She attended our Sunday School, although her parents did not belong to us, and grew deeply attached to our Church. Associated throughout her married life with Ryhill Church, Barnsley II. Circuit, she was a most diligent and ungrudging worker. In no small measure our beautiful church there is a memorial of her heroic devotion and faithfulness. Her interest in the cause was such that the church and all its arrangements had to be of a kind she could be justly proud of. In spite of bodily weakness and suffering she lived on “the sunny side of the hill,” and exerted a remarkable influence. Her home was a place of peace and holy love, and much of its charm was due to her thoughtful management. Her kindly disposition, her attractive quaintness of manner, her absolute simplicity, and her generous response to any claim of the moment were beyond praise. The welcome she extended to the Lord’s servants who visited her home was beautifully unaffected. She was indeed an elect soul, and will be long and gratefully remembered. The members of the church will think of her familiar face, her kindly greeting, her cheerful interest in the church’s prosperity, and preachers ministerial and lay will never forget her gracious presence and womanly bearing. All will count her a fair blossom plucked for the Master’s use whose fragrance is still in the air, and whose beauty knows no decay. All who had known her were moved to the depths by the tidings of her death. Lydia was born on 13 June 1853 at Scholes Moor, Yorkshire, to parents John, a carrier, and Martha. She was baptised on 14 August 1853 at Holmfirth, Yorkshire. Before her marriage, Lydia worked as a dressmaker.